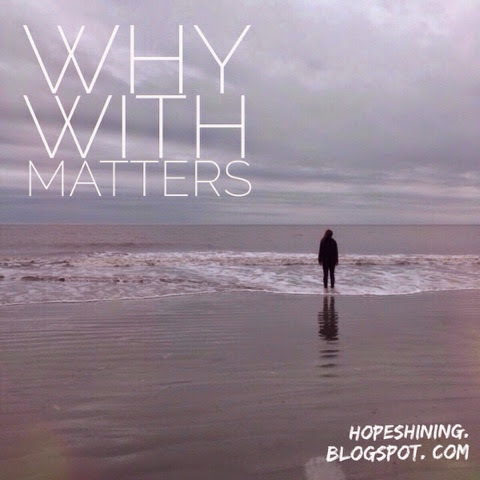 Deborah Spooner: Why With Matters || Cause Who Wants To Be God's Enemy? Why With Matters || Cause Who Wants To Be God's Enemy? When’s the last time you stopped doing and thought about being - thought about being with? We’re all with a lot of the time. We’re with family, with friends, with co-workers, with schoolwork, or we’re surrounded with people, with images, with thoughts, with feelings, with ideas. We can get so caught up in doing that we forget how to do the being; we forget to look around us. We forget to see who and what we are with and how that’s influencing us. We communicate with our family because that’s just what we’re supposed to do, yet how often do we think about enjoying being with them? We do our school or go to work because we need to do it, but do we think of how we’re influenced by what we’re being surrounded with – the lyrics in the restaurant or that overheard conversation? “…to walk humbly with your God” Yes, our God wants us to do right things. He wants us to love kindness. He just doesn’t want us to do those actions, though; He wants a walk with us. God doesn’t just want what we do; He wants to be with us. The God of the Universe loves us enough to not only want our holiness, but to want our heart; He wants to walk with us through life. If we choose to walk with God, are we going to benefit? “… with God all things are possible’” (Matthew 19:26, emphasis added). When we choose to come to God, listen to Him, and seek Him, we are going to have benefits! Anything is possible for the Lord, and walking with Him shows us new possibilities. We’ll see new opportunities. We’ll see opportunities to love; maybe we’ll see that our mom just needs a hug. We’ll see opportunities to help people; maybe our brother needs someone to challenge him to become who he can be. When we are walking with God, He’s not only going to show us what other things are possible for us to do with our lives, but He will, also, make things that seemed impossible become possible. If we don’t choose to walk with God, who else might we be walking with and what does that mean for our lives? “… don’t you know that friendship with the world means enmity against God? Therefore, anyone who chooses to be a friend of the world becomes an enemy of God” (James 4:4, emphasis added). Being friends with the world means that we’ve got enmity against God. Enmity is “the state or feeling of being actively opposed or hostile to someone or something.” When you find yourself forsaking God and pursuing the world, stop and ask yourself this question: do I want to be opposed to the Almighty? We can learn even from this verse’s specific phrasing: we are the ones who actively choose to be a friend with the world. With this choice are going to come consequences; we become enemies of God. I don’t know about you, but I do not want to be an enemy of the Creator. Ultimately, here’s what it comes down to: Who are you going to choose to be with? Who you’re choosing to be with is going to affect who you are. Who you are is going to affect what you do. What you do is going to affect what kind of life you have. If you choose to walk with God by seeking Him and obeying His word, new possibilities are going to be found and impossibilities are going to become possible. If you choose to be friends with the world, you’re going to be God’s enemy. Well written ! It contains both:Sound Doctrine and reaching out! Read it a long time back. Convicting! Because of HIS GRACE we are not consumed!